I think I pressed my snooze button four times this morning, I wasn't entirely sure it was a day I needed to get up early. But it is. And I only have a few moments to post as I'm getting ready to go teach today. I hope you had a nice weekend! Did you? I have several surprises to share but they will have to wait until this evening when I have more time to write. In the meantime, enjoy Monday and go check out the new links I just added to "10.15 this weeks new :: inspiring :: interesting :: creative people" in the right column. 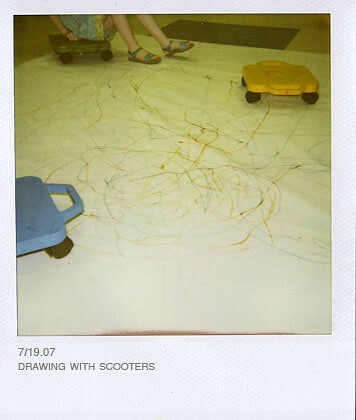 :: polaroid I took this summer one day at art's based preschool, where I teach.